Late this afternoon I received a text from a good friend, asking if I had set up a new Facebook profile, as she had received a friend request from me. I hadn't, of course and it seems someone had cloned my profile details & set up a fake "me". They then sent friend requests to my existing friends. Whilst it was all sorted pretty quickly - I asked another friend to report it, as I was away from my devices (I don't have Facebook on my phone) - I do wonder how it happened. I know my profile photo and background image are public, so can be re-used, but quite how this account could send friend requests to my friends, I'm not sure. All my settings are "friends only" wherever I can do that, so unless they had logged into my account, they shouldn't have been able to see that information. I have login alerts set up and there were none sent out. In addition I run a VPN, even at home, which I thought provided some additional security. A small amount of time on Google implied that it had to be done by a "friend". A little perturbing, as I don't have friends I don't know. However, it happened and fortunately Facebook closed down the faker within 10 minutes of having it reported. I can understand why people leave Facebook. I don't post there much, I just check in to see what friends are up to: people I wouldn't otherwise have time to keep in touch with. I don't often post there myself now. I post occasionally on Twitter and I chat on App.net, a place where I feel very much amongst friends. But I'd miss Facebook if I left. Naturally, my password manager now has an even longer Facebook password than it used to have, though I don't think that was compromised. Although, thinking about it, I really should change passwords more regularly. At least I don't re-use them on different sites! I have a confession, one that probably won't surprise anyone who knows me: I have a bit of a thing about fountain pens and stationery. Yesterday I got into an exchange with a good friend on Facebook, whose addiction is more of the stationery kind than fountain pens. I pointed her towards several blogs I follow, as well as The Pen Addict podcast and Slack group. I don't know if she will listen, but she might. She might find some interesting feeds to follow on Instagram from checking out the people I follow. On Monday evening I listened live to the podcast for the first time and I realised just how much pleasure I get out of listening, and interacting with fellow pen addicts in the Slack group. As a result, today I signed up for membership of Relay FM. It looks like a good way to support the work they do. I'm lucky though, I'm in a position to be able to do these things, so why shouldn't I? I wrote this a while ago and then forgot about it. Every moment is just that - a moment. We step from moment, to moment. We can only go on, until we stop. Brief snippets of time are enough. Any more would be too much. Too much of the picture might be revealed. A photo taken with the wrong filter. No whispering breeze wafting the grass. No smiling sun warming the land. A watercolour landscape washed with grey. No-one to turn to, no-one to listen. Achivements, disasters, snippets of my day. The one whose love I always knew, always felt. Whether she realised it or not. Who believed she had nothing much to offer. Yet she leaves behind more than she could ever know. Whenever I play the piano, her influence is there. Ok, not so much with maths or computing. Explaining her email to her once more. So it seems she's in there, too. Progress is slowly being made with reinstating Dad's garden gate. For the last few years it has just been lying across the side path - not exactly providing any security. The reason for this was that the hinge brackets that came with the gate were not easy to fix to the brick wall. More properly, the spacing of the gate struts meant that the hinges had to be fixed to the very edges of a brick. For some reason the style of the gate was incompatible with the spacing of the bricks. One of the bottom brackets was partly secured by being screwed into the mortar between bricks, never a reliable option. I found some posts which allow the gate to be hung on them, rather than hinges bolted to the wall. Of course, the posts were a little thicker than the holes in the gate, so today we drilled/filed out the holes a bit and sized the gate up against the wall. The upper support can be screwed securely into a couple of bricks, but the bottom one will be a little closer to the edges of the bricks than I would like. Still, it should be secure enough. It only stabilises the gate, rather than taking any of the weight. Normally both posts would be upright, allowing the gate to be slotted on to them. However, that doesn't work with the brick spacing, so we decided the bottom one would point down. This means it has to be put in place after the gate had been hit on the top bracket. The upside is that no burglar would be able to lift the gate off its support without unscrewing everything either. Once the holes are drilled for the top post - something I have left my father with for the week - then we can do the rest next weekend. Once that is done, new holes will have to be drilled to accommodate the new latch position, the gate sanded and repainted. That last bit can wait; as long as the gate is in place I will be reasonably happy. I bought this pen on impulse, mostly because I was frustrated that the Pelikan M205 Amethyst hadn't come out at the start of August. I rather liked the idea of the silver marble, but for some reason, at the last minute, my eye was drawn to the antique marble. I haven't been disappointed. I ordered a fine nib, a steel one rather than a gold one. A good steel nib is perfectly acceptable nowadays. I do like gold nibs, but I'm not going to get hung up on them. 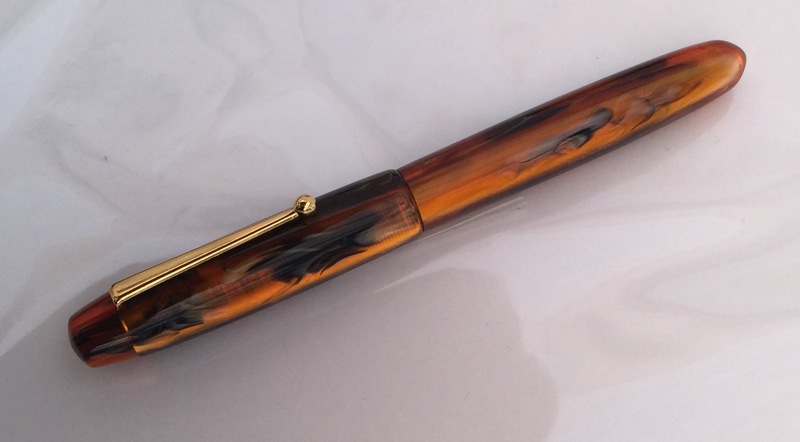 So I ordered this impulse pen - which at £115 was more expensive than the Pelikan I planned to buy. As I am in the UK I limited my choice to the production range, rather than the custom one from the US, along with the customs charges that would apply. I find it difficult to express just how delighted I have been with my purchase. This pen is simply gorgeous. It is perfectly weighted, it fits in my hand just so (I don't have small hands, I have piano-playing hands with a pretty decent stretch) and writes beautifully. The body is silky-smooth, with stunning colouration in the marble design. It reminds me of tobacco being rubbed in the pouch (a favourite task of mine as a child was to flake my Dad's pipe tobacco). The nib is smooth, just a small amount of feedback. I bought a fine and it is a very usable line size. To start with I tried a few inks out just by dipping. I do feel that pens each have their happy ink. My gold-nibbed all black Parker 45 CT would be wrong without black ink in it, for example. My clear TWSBI 580 also seems to have settled with black ink. My Violet-capped Faber-Castell Loom fits well with Diamine Imperial Purple. In some pens the end result differs wildly. 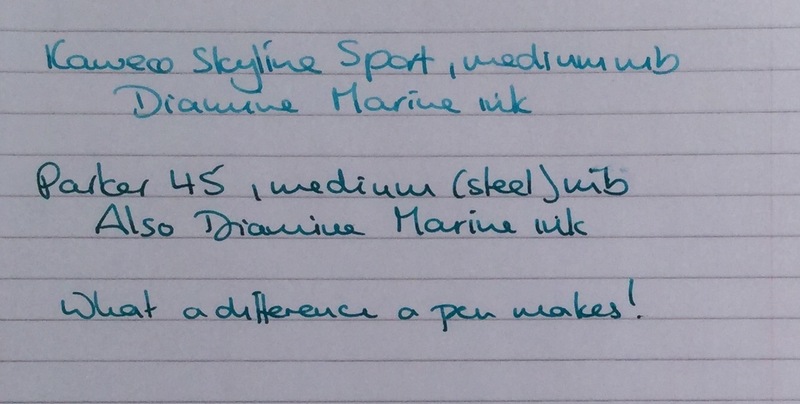 Both my Kaweco Skyline Sport and my steel-nibbed Parker 45 have Diamine Marine in them, but the result in the page couldn't be more different, as the photo below shows. As the Kaweco is the mint green version I really wanted to fill it with Marine, expecting the colour the Parker produces. I was disappointed, but then I think the Kaweco nib still needs some work on it as it skips rather more than I would like. I digress - perhaps a topic for another day. Back to the Collier. As a brown-ish pen, it really didn't warrant black ink, but I really have no liking for brown inks, so that left my blues, of which I have four: Diamine Imperial Blue, Diamine Misty Blue, Diamine Blue-black and Cult Pens (also Diamine) Deep Dark Blue. I opted for the DDB, as I call it. I have since tried the blue-black in the pen, but with the fine nib it looked rather thin and pale, so the DDB went back in. Ironically, I loaded my TWSBI AL with the Imperial Blue, which left me without a pen with blue-black in, so I decided to try that in my Pilot Capless. The TWSBI brought out the teal tones in the ink, in the Collier it appeared lighter than the DDB, but in the Pilot (also a medium nib, as is the TWSBI) the blue-black is very dark indeed. So here it is, a pen I am very taken with. It is always in my daily carry pen case now and I don't see it leaving any time soon. I keep my clear TWSBI and my Pilot Capless with my Midori Travelers Notebook and in my Lihit Labs smart fit small pen case I have my Parker 45, my Cult Pens mechanical pencil, my Pelikan M205 Amethyst (it came out, I bought it, but then that was never much in doubt - it's purple), my TWSBI AL (purple) and the Edison Collier. So I guess my handbag contains a fair amount of pen wealth, but I can live with that. It has been one of those days (weeks/months even). So far I have managed to forget - yet again - that taking a photo in portrait alignment is worse than pointless if you want to use it in a blog post, as most of the time it gets rotated to display in landscape. I have been caught by this before and had it explained to me by people who understand these things. At least this time I have made myself a note, in both Evernote and Onenote. WordPress is hanging on uploading a photo (correctly oriented). I don't use it often and I'm now reminded why! Windows 10 decided to tell me it was downloading today: it told me that last month, I just didn't install it. Perhaps that's the penalty ; if you download and don't install, every month or so it will download again, just to fill up my hard drive and hammer my already pretty measly internet connection. I have decided I like iOS 9 though, apart from the little hiccup of an ad blocker app being withdrawn from sale a day after I buy one. There are some useful features in the new OS, ones that I am already using quite a lot. I am now starting a week off work, which is a great relief. Less of a relief was that most of my systems crashed towards the end of the day, so I was unable to finish some things I wanted to do. File that one away with the other annoying work things that have happened this week. It just seems that no matter how good, how helpful, some people are never satisfied… But enough of that, I'm on holiday now and I don't intend to get into an argument (with myself) on the internet about the correct amount of gratitude that should be shown by people who are, essentially, living off handouts. I want to look forward to some days out in the early Autumn sunshine and a visit from my best friend. What's that? Yup, the forecast is mostly for rain. Of course it is. Yesterday I stood for a while in the kitchen, looking out into the back garden. I was mesmerised by the activity at the nyjer seed feeder. I put a small, two-bird, feeder up last year, not expecting to see much activity. The large, general, seed feeder I have sees very few visitors (which is a shame, as I have plenty of feed for it). However, soon some beautiful goldfinches started to eat the nyjer seed and regular activity has continued at this feeder. Note to self: buy a larger one. Last night the feeder had two birds at it, noshing away. A third was on the washing line nearby, with a fourth sitting on the neighbouring garage roof. Bird 3 hopped from the washing line to the top of the bracket the feeder hangs from. Bird 4 took his place on the washing line. Bird 3 then hopped down from the top of the bracket to perch on the hook part. He then peered intently at the occupants of the feeder for a few moments, hanging a quite a crazy angle. Next he hopped down on to the top of the feeder itself. One of the occupants looked up then flew away, allowing Bird 3 to take his place. Bird 4 was still waiting his turn, sitting on the washing line. Bird 3 amused me. He looked like a cheeky chappie. For all I know he was a bully and was making threatening moves towards the other finches, but I like to think not. I chuckled every time he moved that little bit closer to his goal. Simple pleasures. 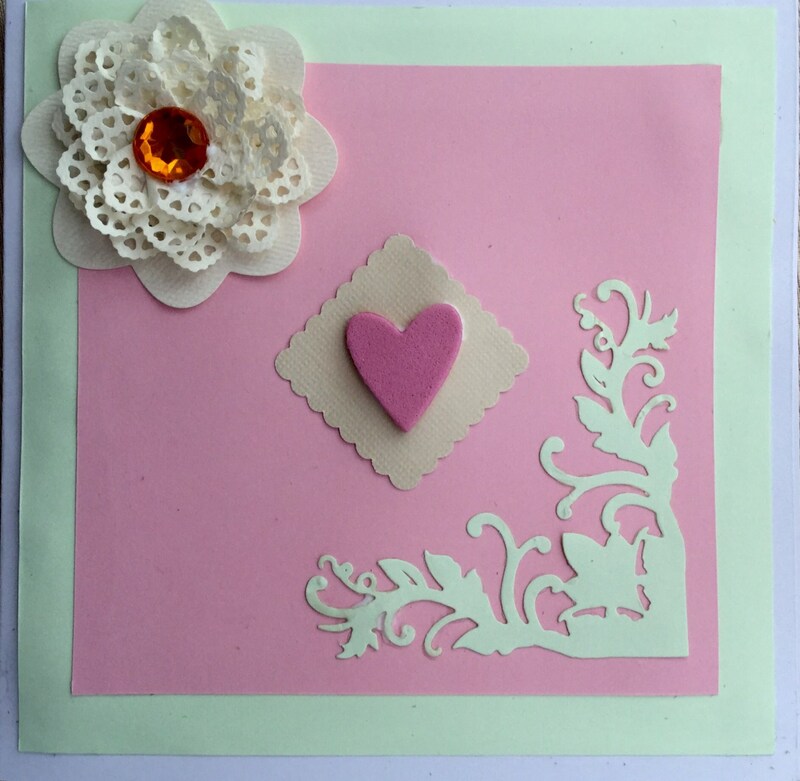 Trying out a couple of new Tattered Lace dies I bought. About a month ago I saw a post on a local facebook group which was advertising a weekend course leading to the Foundation Amateur Radio Licence exam. In my teens/early twenties, I used to do a lot of shortwave listening. It started with an old radio which I used to listen to shortwave broadcast stations at night - in the days when there were plenty of them around. I later moved on to a Lowe HF-225 which enabled me to listen to SSB transmissions as well. When I moved to London I made more use of my scanner, on airband. I used to sit on my balcony and watch Concorde fly over while listening to the pilots talk to Heathrow approach. I did investigate taking my amateur exam, but it seemed in the too difficult category back then. The lowest grade was the Novice exam and for someone who happily left physics behind at the age of 16, it was a little off-putting. Plus, the Novice licence didn't allow access to the HF bands, which seemed a little restricting to me. Fast-forward to 2014 and here was this post… Places available on a two-day course. I looked up the Foundation licence and it appeared to be eminently achievable. It seemed as though fate was about to intervene to rekindle and extend my old hobby. I duly booked onto the course and a couple of weekends ago I headed off to the local radio club for my tuition. I thoroughly enjoyed the weekend, despite being a little nervous. It turned out there were only two students, so it was a very relaxed setting. I learned loads and, best of all, passed my practical tests and the exam, so am now the holder of a licence and an M6 call-sign. I am looking forward to exploring some of the myriad of avenues open to a licensed amateur. I know that modern technology has taken over from a lot of the old amateur interests, but they are still out there. Phone signals go down in emergencies, phone batteries don't last long. Handheld radios do. Computers and the internet, whilst doing away with a lot of the old broadcast shortwave stations, have brought with them additional amateur interests and have extended others. My Dad used to hook the Lowe up to his computer and decode weather fax transmissions. I have weather apps. Times change. During the course, though, I watched data being picked up from amateur high-altitude balloons. Fascinating. Computers have added a lot of data modes to amateur radio, as well as things like Echolink, which I might investigate at some point. Amateurs now monitor, and use, satellites. They do moonbounce contacts. Oh, and someone built a space station and the astronauts on it use amateur radio to talk to people on earth. Imagine the thrill of speaking to an astronaut on the ISS! I will be listening in at least. I have yet to speak to anyone, but then I only have a 2m/70cms cheapie (but very usable) Chinese radio. That said, last weekend a new repeater fired up pretty local to me. Excellent reception, so I have been listening in to some of the testing that has been done. So much still to explore and learn; this is just the beginning of my adventures in amateur radio. Another ink I had to wait for. Then, when I got it, I put it in one of my Parker 45s (the one that now has Marine in it), No amount of soaking or flushing was successful in eradicating all traces of my usual black ink, so I had to abandon using the autumn oak. Also, I decided it would probably look better in a wider nib, so I loaded my Safari with it. I think this was a good decision: I intend to use this ink for decorative lettering, so having a wider nib is more useful. However, this nib/pen seems to run a little dry with this ink, so I have to be careful to avoid gaps. I have only used this combination, so I have no comparison to make with this ink in other wide-nibbed pens, or other ink in this pen. 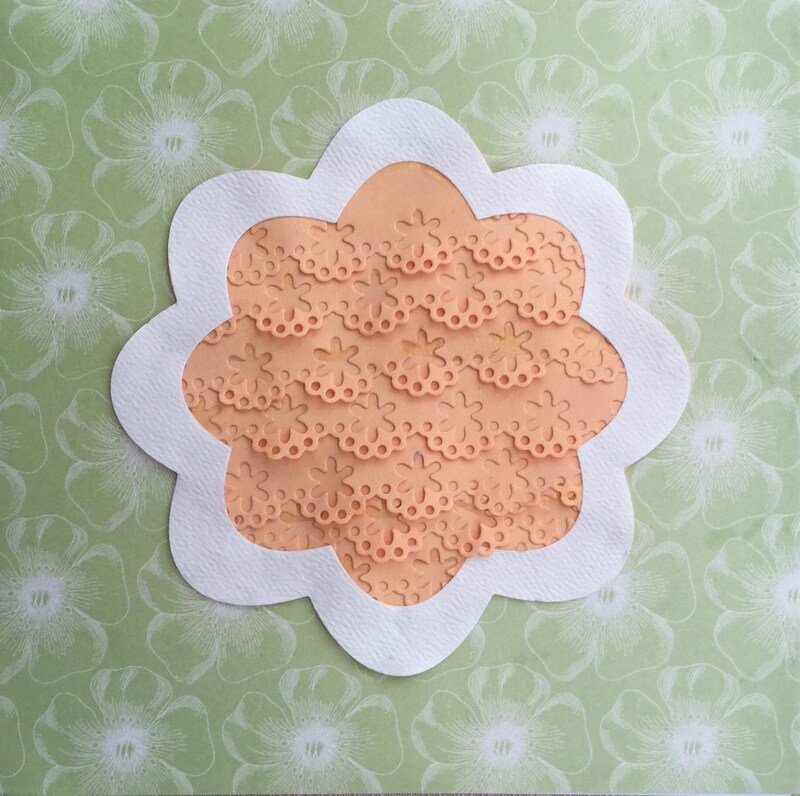 That said, I shall continue to use it as it's lovely compromise between orange and brown for me.